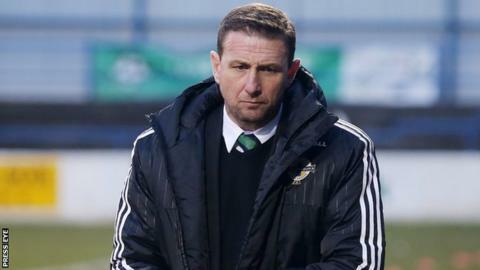 Northern Ireland Under-21s warmed up for their Euro qualifier with Spain next Tuesday by beating Luxembourg 1-0 away in Thursday night's friendly. Rory Holden scored the winning goal for Ian Baraclough's side in the 11th minute. The win will boost confidence in the camp ahead of next week's game against the unbeaten group leaders in Albacete. Northern Ireland are fourth in Group Two, level on points with Iceland and one behind second-placed Slovakia. Queen's Park Rangers forward Paul Smyth intercepted a stray pass from the Luxembourg defence before cutting in a ball for Holden to finish inside the box. Last night Spain beat Albania 3-0 and Iceland defeated Estonia 5-2 in qualifying fixtures for next year's finals in Italy. Northern Ireland have three games left to play. Spain have won all their seven matches to date and are set to qualify automatically as one of the nine group winners. The four runners-up with the best records contest the play-offs.